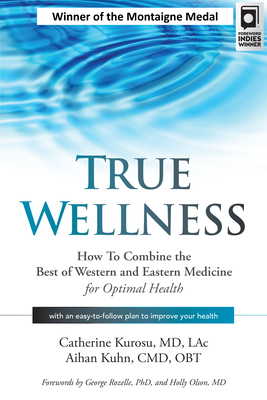 True Wellness is a step-by-step guide to optimal health, blending the best of each medical tradition. The authors are both Western-educated physicians who also trained in Eastern medicine. They have more than sixty years of combined clinical experience and have helped thousands of people through the use of surgery, pharmaceuticals, acupuncture, herbs, qigong, tai chi, meditation, and lifestyle counseling. The authors have realized the conventional way of managing disease is unsustainable. They recognize that even as the high-tech accomplishments of Western medicine increase, the overall health of the nation continues to decline. In their own practices, however, they have discovered a path to optimal health, even in the complicated American health-care system. The secret is combining the strengths of both Western and Eastern medicine to achieve the unique health goals of each patient. With this book you will Discover the strengths and benefits of both Eastern and Western medicineUse journaling topics, questions, worksheets, checklists, and practical advice to prepare for and begin new, healthy behaviorsLearn to create a multidisciplinary care team for a strong alliance between your Western health-care providers and Eastern practitioners The authors explain how exercise, nutritious food, stress management, acupuncture, and qigong affect the body, so you can make healthier choices. To help you move forward on a new path, they provide practical advice and worksheets to start simple daily exercise routines, eat a plant-based diet, and begin qigong practice. True Wellness encourages individual responsibility and prepares you to take the first step on your healing journey. By combining ancient wisdom, cutting-edge scientific discoveries, and practical advice, this book will lead you through a transformation to true well-being in body, mind, and spirit.